Kindle users will have to check out e-books through their local libraries, so they'll need a library account to do so. (CNN) -- Want to check out e-books from the library and read them on your Kindle? That will be possible later this year as Amazon announced Wednesday that it would join a library loan program for electronic books. More than 11,000 libraries in the United States participate in this electronic-book-loaning program, managed by a company called OverDrive. 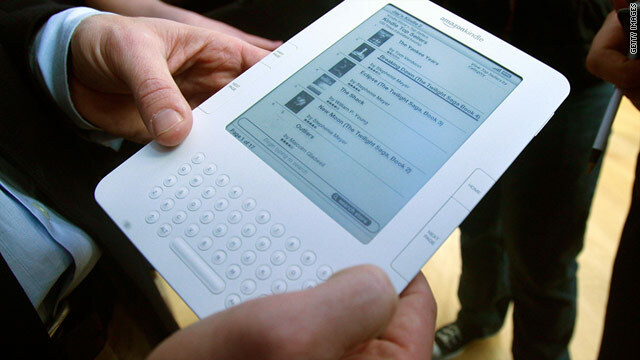 Amazon, whose Kindle is the top-selling e-reader, is the last big e-book company to make this technology available. The Barnes & Noble Nook and Sony Reader already allow users to check out digital books from their local libraries using the service, according to OverDrive. The company offers more than 400,000 digital books and has had a library loan program for e-books since 2003, said David Burleigh, an OverDrive spokesman. The electronic-book checkout process is similar to that for real-world books. Libraries purchase licenses to offer certain titles to their patrons. Books are checked out for a certain period of time -- two weeks in many cases -- after which they become locked and inaccessible on a person's e-reading device. "Most of the books in the collection are one copy, one user, which is similar to the print model," Burleigh said. "So when it's checked out it's unavailable for anyone else until it's returned." Amazon said the library books will be available on the Kindle "later this year," but the company did not specify a launch date. The free e-books will be available though Kindle apps on smartphones and on the Kindle e-reader device, which can download books over Wi-Fi or 3G internet connections. The service will work only in the United States. "We're excited that millions of Kindle customers will be able to borrow Kindle books from their local libraries," Jay Marine, Amazon's director for the Kindle, said in a press release. The library books will sync with many of the Kindle's existing features. "Normally, making margin notes in library books is a big no-no. But we're extending our Whispersync technology so that you can highlight and add margin notes to Kindle books you check out from your local library. Your notes will not show up when the next patron checks out the book. But if you check out the book again, or subsequently buy it, your notes will be there just as you left them, perfectly Whispersynced," the Amazon release said. Kindle users will have to check out books through their local libraries, so they will need a library account to use the service. To see if your library has a contract with OverDrive, and therefore will be able to loan you Kindle books, go to overdrivesearch.com and type in your ZIP code. OverDrive's Burleigh said this service helps make library services available to new groups of people, who may not be inclined to go to a physical library to check out hard copies of books. "Libraries have always been at the forefront of making new forms of reading available," he said. "It's helping them do that and to reach more people in their communities."